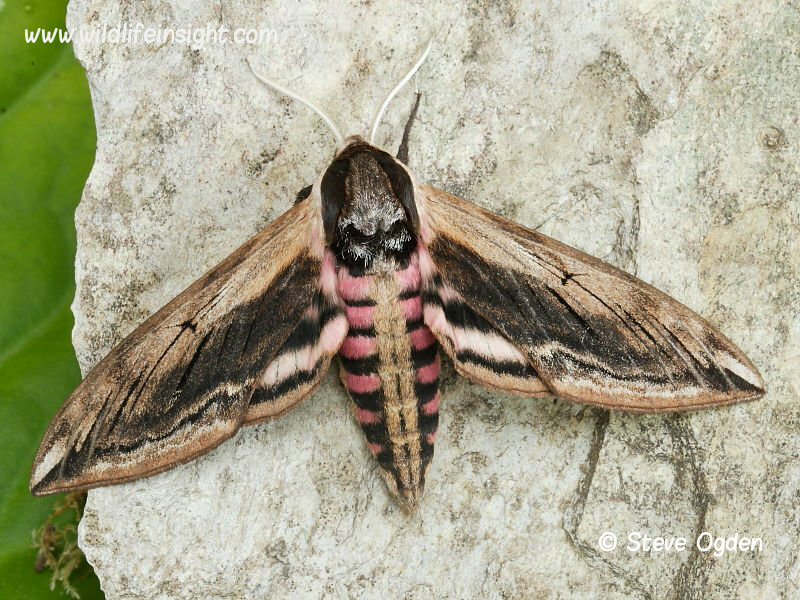 The Privet Hawkmoth, Sphinx ligustri, is a member of the large Sphingidae Hawkmoth family and a species commonly found in the southern half of the UK and much of Europe. It has a wide wingspan of approximately 120 mm and flies in a single generation from June to July. At rest the wings are held tightly to its side, when it can occasionally be found on trees, walls and fences during the day. When disturbed it opens its forewings to reveal a boldly, red and black striped abdomen. The photos of Privet Hawkmoth shown are of specimens attracted to light and one found during the day on a fence post in South West England. The caterpillars of the Privet Hawkmoth are featured below. The Privet Hawkmoth caterpillar, Sphinx ligustri grows to 85 mm in length, is bright green with white, purple edged, diagonal stripes. The mainly black tail horn and black facial collar can help with identification. Unlike many Hawkmoth caterpillars the Privet Hawkmoth larvae do not have different coloured forms. The caterpillars feed on Privet, Ash, Lilac and Snowberry. The photos shown are of Privet Hawkmoth caterpillars either found in the South West of the UK or reared from females attracted to light. Prepupating Privet Hawkmoth caterpillars such as the one shown recorded by Allan Knapp are reddish brown dorsally. They are frequently sighted on the ground searching for a place to pupate in the soil. The pupae overwinter, with the adult moths emerging in early summer. Other commonly sighted Hawkmoth caterpillars in the British Isles include the Poplar Hawkmoth, Eyed Hawkmoth and Lime Hawkmoth. The caterpillars of Oleander Hawkmoth caterpillar, Death’s Head Hawkmoth, Convolvulous Hawkmoths and Striped Hawkmoth are other species only occasionally recorded in the UK but commonly recorded in warmer parts of the world. An interesting late in the year sighting was made by Barry Ofield in October 2015 of two final instar Privet Hawkmoth caterpillars in a Snowberry hedge in his Cornish garden. Despite being in their final instar and fully developed they were only 65 mm long. Barry reared them through and they pupated successfully before overwintering as pupae. Both moths emerged the following June and were also very small as can be seen in the photo when compared to a set specimen reared by Barry in 1960. Possibly this had been a second brood that had failed to develop properly due to falling temperatures. Nevertheless, the two emerging Privet Hawkmoths were perfect specimens in all but size. Many thanks to Barry for his observations.